Since 2006 he is affiliated to Stones Throw Records where he released his debut longplayer Ode To The Ghetto followed by two more highly acclaimed albums and a string of moving 12 and 7inches. 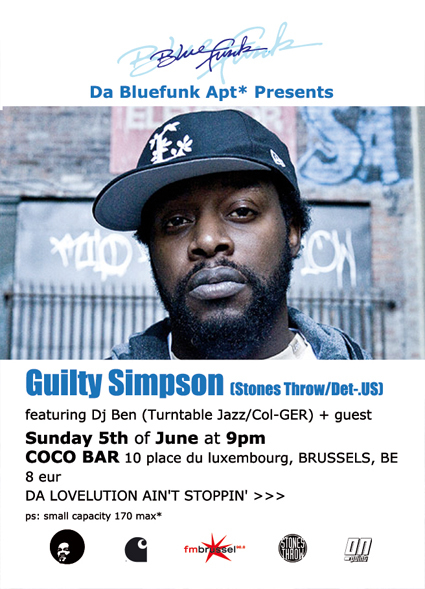 This Sunday he stops by at Brussels finest Coco Bar for an intimate show. Those who seen him live know that his serious inner city topics are always enlarged with a good sense of humor. As a rapper who was raised on the field of battle this Detroit boy has more to say than just how fresh he is. As a matter of fact Quilty Simpson is here to remind the Hip Hop world that life in the ghetto is real. But don’t be afraid: he also likes to party and see his fans dance.